There is no athlete quite like the hockey enforcer, a man and a role viewed alternately as noble and barbaric, necessary and regrettable. Like so many Canadian boys, Boogaard wanted to reach the National Hockey League on the glory of goals. That dream ended early, as it usually does, and no one had to tell him. But big-time hockey has a unique side entrance. Boogaard could fight his way there with his bare knuckles, his stick dropped, the game paused and the crowd on its feet. And he did, all the way until he became the Boogeyman, the N.H.L.’s most fearsome fighter, a caricature of a hockey goon rising nearly 7 feet in his skates. Over six seasons in the N.H.L., Boogaard accrued three goals and 589 minutes in penalties and a contract paying him $1.6 million a year. On May 13, his brothers found him dead of an accidental overdose in his Minneapolis apartment. Boogaard was 28. His ashes, taking up two boxes instead of the usual one, rest in a cabinet at his mother’s house in Regina. His brain, however, was removed before the cremation so that it could be examined by scientists. Boogaard rarely complained about the toll — the crumpled and broken hands, the aching back and the concussions that nobody cared to count. 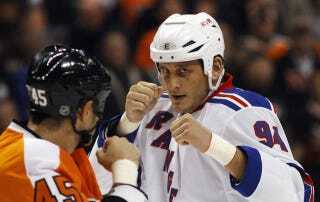 But those who believe Boogaard loved to fight have it wrong. He loved what it brought: a continuation of an unlikely hockey career. And he loved what it meant: vengeance against a lifetime of perceived doubters and the gratitude of teammates glad that he would do a job they could not imagine.